Post-it Greener Notes are the greener version of the original Post-it Notes you know and love. Made with 67% plant-based adhesive and 100% recycled material - which means no new trees were used. Use the 3 in. x 3 in. size for notes or reminders to yourself or others. Unique adhesive designed for use on paper or in planners. A World of Color Helsinki Collection brings airy and clean colors that honor the simple pleasures of Scandinavian living. 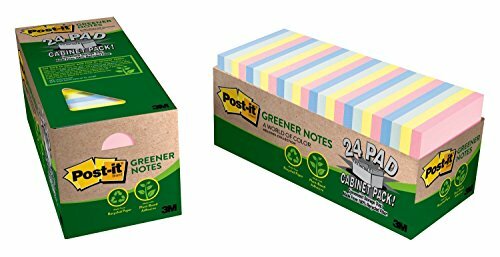 Post-it Greener Notes are recyclable. Cabinet pack keeps pads in a neat box until needed. 24 Pads/Pack, 75 Sheets/Pad. Color: Helsinki collection cabinet pack.